If you aren’t native to a place you have an excellent chance of becoming a gentleman in it. Histr’y ain’t got eyes to see everything. George Lamming was born in Carrington Village, Barbados. 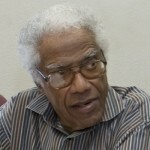 He is a Barbadian novelist, essayist, and teacher. He is an important figure in Caribbean literature. He was educated at Roebuck Boys School and the prestigious Combemere High School. He received early encouragement from Frank Collymore, his teacher and mentor, and editor of the literary journal, BIM. He left Barbados for Trinidad in 1946, and went to England in 1950. He made his home in London for some twenty-five years. During this time he published six novels and a highly influential collection of essays, The Pleasures of Exile. He has written several novels include: In the Castle of My Skin, The Emigrants, Of Age and Innocence, Season of Adventure, Water with Berries, and Natives of my Person. In 2014, he won a Lifetime Achievement Prize from the Anisfield-Wolf Book Awards.